The minute I saw this outfit on the mannequin on my first visit to an Altar'd State, I knew I had to have it. I have been so attracted to mustard yellow lately and jumping back on the revived jumper train has me soooo excited. I used to wear jumpers all the time and loved them. Our Fall Fashion Frenzy link-up Prompt today is Thanksgiving Looks. I could totally see myself wearing this to a Thanksgiving feast but since I am hosting at home this year, I told you on, I'll probably opt for more comfy attire. BUT oh I shall be wearing this cuteness a LOT! I liked pairing the top underneath with a sleek fit and flared wrists. This shopping stop on our Nashville trip was quite prosperous as I fell in love with the trendy boho, flowy trends vibe of the store. If only we had one close. I have a couple ways I thought to style this but since I just wore my over the knee black suede boots last week, I decided to go a different route and do the cute Sock Booties I got from the Target boot sale. A little leopard clutch adds some cuteness too! 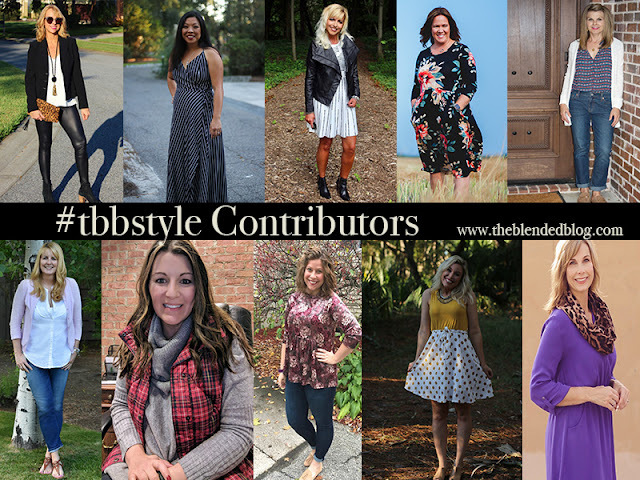 HEAD over to The Blended Blog to link-up your fashion goodness! HAPPY WEDNESDAY ALL YOU CUTIES!! Perfect for Thanksgiving or any outing! We have an Alt'd State at one of our malls and I never miss a visit into the store. I love it! That mustard looks great on you the top is so stylish. Yay for jumpers coming back!!! I hope you're having a great week! Lovely and as uplifting as a 🌄. Don't hide that outfit on Turkey Day - stick on a pinni (apron) and a pair of slippers and you'll be good to get basting, girl! This is so cute and looks fabulous on you. I love those little flared sleeves. I love mustard too and especially on you, gorgeous lady! That jumper looks so great on you! I'm all about comfy on Thanksgiving and stretchy waistbands haha! Bwahahahahaha that memeat the end is sooooo funny! What's not funny is how PRECIOUS you are in this jumper! Gorgeous from head to toe. Love the sock booties - they really are so flattering with a dress or jumper. You rock mustard like no other and that's not always easy on a blonde but you are a bombshell for sure! I always love the accessories you add to your looks! Those tights, the clutch, really highlight the jumper! I just LOVE this whole outfit! That dress is so cute and your hair looks fabulous! Altar'd State is such a great store!! That outfit is super cute! I love the sleeves! We are twinning a lot lately...and I like it! This combo is SO cute! Love the dress layered with this sweater and YES to this color combo! Not just because I'm wearing it today, either! LOL! I had to go back and look to see that this was an actual jumper- sneaky- it looks like a dress. Love the layered fun top underneath! 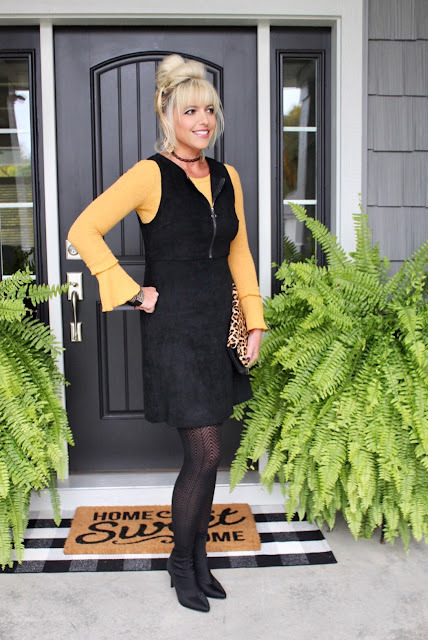 I just love that mustard color with leopard! And you are looking as cute as always! Everything about this outfit just screams my name. Especially the fun tights!! And the yellow sweater. And the sock booties. See what I mean?? What a darling look! Also, the best part of hosting Thanksgiving is getting to wear whatever you like...and the leftovers! This really is the prettiest look! I don't know what I'm wearing for Thanksgiving but you are giving me ideas! Love the yellow top underneath & those sleeves!!! I love this! The subtle bell sleeve is perfect and mustard looks so good on you! Altar'd State reminds me of Anthropologie and they have so many cute things! Love the sleeves on your top! Such a darling look on you! What a cute look. This is definitely something my SIL would wear. Totally sending this to her! You are reminding me of my jumper phase too.. I used to wear them as well. 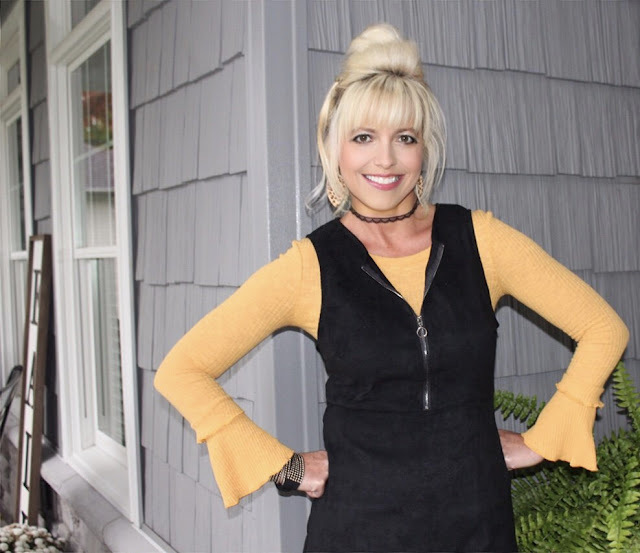 I love this black one on you and the mustard is so perfect with the bell sleeve! LOVE the sock booties, you look darling! I don't know what I am wearing for Thanksgiving.. but comfort is key! Cute! I love that jumpers are making a come-back! And you know, I never liked the mustard yellow color, but recently it has really been growing on me. 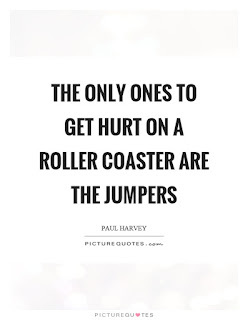 Jumpers! I have forgotten about jumpers. I used to wear them all the time in the 80's and 90's. I'm all in! Bring the jumper back girl friens, you look awesome! Stunning, as usual, Andrea! I love that delicate autumn yellow on you - just flawless! Also, the bell sleeves are beautiful on you! So cute as always! I think it is so funny that the trends of my high school years are back, I had something just like this in 1995! This outfit is so cute and so YOU! I just love the jumper and the sock booties! I recently got a pair too and wore them with a dress for church this weekend. I think I have some sheath dresses in the back of my closet I need to pull out and wear as a jumper! Hope you are having a good week! Love the mustard top and I just found myself a mustard colored sweater recently. You have the perfect fall look! So pretty! And I love it with the leopard clutch. I love that mustard color on you, the sleeves are so fun! I haven't been to Altar'd State in awhile, I need to make a trip soon! Our store always smells so good. Such a cute look! Love the yellow top. Such a great look on you ! Love the yellow top !! I need a good jumper and this one looks fantastic ! Oh, that's a cute jumper. I really like the mustard yellow with it. What a perfect look for Thanksgiving!! I love the mustard top! Always so gorgeous Andrea!! That's a super cute look, Andrea! I can see why you had to have the outfit! It's like it was made for you! I am loving this outfit, lady- so PERF for Thanksgiving! That little pop of yellow is so festive! Love love your outfit!! You look so fab in yellow. This is the cutest jumper! I love it with the mustard and those tights are just the cutest with it! THis is the cuuuuutest outfit. As a Pittsburgh girl this screams Steelers with the colors ;) you’re darling! I LOVE this jumper! I would love to wear something like this. It looks fabulous with the mustard top too. This is so cute on you! Would be the perfect look for Thanksgiving! This outfit was made for you!